Orange Tressostar tape is back and we have it in stock. You may remember that it was discontinued by the manufacturer, but they seem to have come to their senses and realized that orange is the greatest color on earth. And it looks great under shellac. I hope they keep making it. Green is still discontinued or not available or something. In other news, we now have 103mm Grand Cru Bottom brackets. Also, the long delayed 1-1/8" Grand Cru sealed bearing headsets are back in stock. 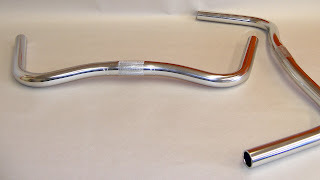 The even longer delayed VO handle bar bags have been shipped and are probably sitting in customs right now. The VO stems are still a couple of weeks out. I really under-ordered them; sorry. 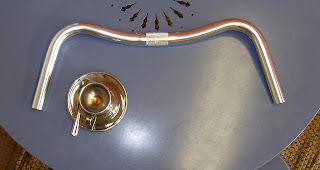 We just received sample VO Porteur bars. 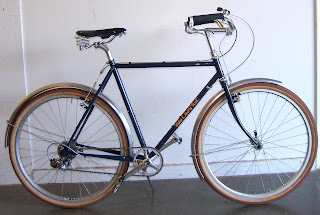 You may remember that we used to sell NOS Belleri Porteur bars from France. Of course Belleri is long out of business, but hardly a week goes by without someone asking if we have just one last pair. So I decided to make our own Porteur bars. The samples are perfect (a welcome change) with a 48cm width, about 2cm drop, 25.4mm clamp area, and 23.8mm tubing. The quality and polishing are very nice. The transition from the grip to the curve on the originals was a little more abrupt, which is actually very attractive. Our version has a gentler transition. The curves on both versions are fuller and, to my eye, prettier than the somewhat similar Champs Elysées bars used on the old Herse bikes. They should arrive in about three months. I don't know what the price will be yet, maybe $30-$35. We built up the production Rando frame prototype with an old Campy 10 speed drive train and some, mostly European, racing parts. Please don't read anything into the build; it's just used stuff I had on hand that needed a home. First the good stuff, the bike rides flawlessly. It can be ridden no-handed at very low speed. It neither dives nor wanders in fast corners. The frame is flexible enough for comfort, but does not feel at all noodley. And it planes like a Boeing 747 ;<). The lugwork is generally pretty good as is brass penetration around the BB shell. No heat distortion is evident. These are signs of a well made frame. Now the bad stuff, The fork legs are 7-10mm too short and the bend is not right. I also think the fork may be a tiny bit too stiff. A new fork is being made even as I write this. The paint color is nice, but the quality is marginal. It can be very difficult to spray light silver and I don't think the paint shop in Taiwan has the skill to do it really well. At my old boat company we often had problems with paints that had relatively little pigment, like light yellow and light silver. The blue on the city frame is very nice and I've decided to use that color for the Rando frame. The city bike will be dark gray which should be easier to spray. The seat stay caps and the slap guard fittings will be replaced with more attractive versions. Samples are being sent. 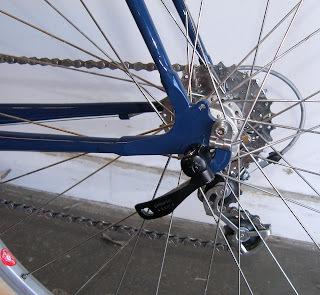 This frame is designed for long reach (47 to 57mm) brakes set near the bottom of their slots. The ideal tires would be high quality supple 27-30mm tires such as Paselas 28mm, Grand Bois 28 or 30mm, or Challenge 27mm (which are really 29mm). 45mm fenders fit. The above tires will provide a comfortable ride and low rolling resistance, making this bike suitable for fast club rides as well as brevets or weekend credit card tours. It is not, however, a good loaded touring bike. The tubing is all double butted CR-MO in traditional, not modern oversize, diameters. Tubing specs are virtually identical to those used on our semi-custom Pass Hunter and Rando frames. The low trail design is prefect for a handlebar bag. There are braze-ons for a VO rando rack. As soon as the new fork arrives we'll put fenders on and finish testing. Then we OK production. Here are a few questions that regularly appear in my inbox. These particular questions bug me because I think folks should know better. And I'm feeling rather grumpy this rainy morning. So I thought I'd write a grumpy post. Can you sell me a fork for my frame? No; we don't make custom forks and using stock replacement forks on a frame is often a mistake, which is why we don't sell them. The frame's designer, presumably, sweated bullets to get the handling of your frame just so. Now you want to install a fork that has different trail and a different length. If you change the rake, you'll change the handling. Some folks understand the way that works, but most don't. 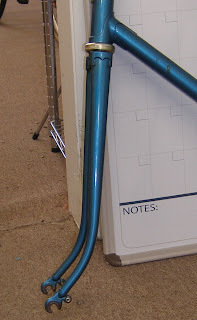 If the fork legs are longer or shorter you'll change the slope of the top tube. I know I'm a perfectionist and you are free to disregard my advice because of it, but if you need a new fork get one from a local frame builder, a frame builder who can actually measure your frame. I know you say that fenders need at least 8-10mm of clearance, but I really want to run 32mm tires in 36mm fenders; is that OK? No! Never! If you don't have enough fender clearance, little twigs and pebbles will get caught between you fender and tire. At best this is an annoyance, at worst something will get jammed between the tire and fork crown, stopping the front wheel and sending you skidding face first along the pavement. Proper fender clearance is far more important that the current fad to jam the largest possible tire into every frame. Only those with the most sensitive behinds will be truly bothered by the difference in ride between a 28mm and 32mm tire, but most everyone will find having their nose planed off by rough pavement to be a major inconvenience. Can I run 42mm Hetre tires with 52mm Zeppelin fenders? Of course you can. Hetres are only 40mm wide in real life and 12mm of clearance is fine. Do you still have any NOS (fill in some obscure part we sold three years ago)? Sorry; everything we sell is on our web site. I have some funny ideas about business; one of them is that we actually sell things that we have in stock, down to the last one. 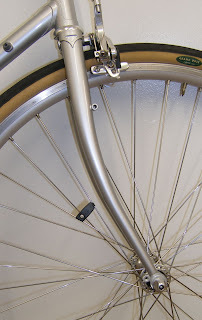 A few years ago I had a frame with horizontal dropouts that had the usual unsightly fender line. The chain stay bridge was set far forward so as to allow enough room for the wheel to be removed. Of course I couldn't shim the fender to the proper position because that would make removing the wheel impossible, at least without deflating the tire. So I decided to try a spring instead of a shim. The spring, and a bolt, held the fender at the proper distance from the tire. 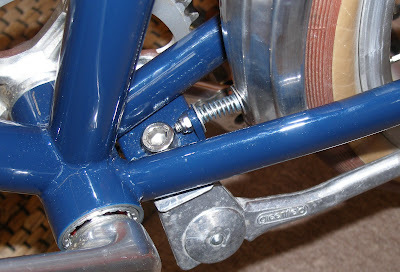 But by compressing the spring the fender flexes out of the way and the wheel can be dropped off. It worked great and I congratulated myself on my clever invention, not realizing that others had previously "invented" exactly the same trick. 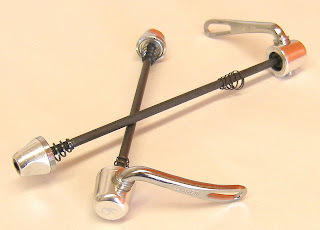 In any case, this photo might be useful to some who ride fendered bikes with horizontal dropouts. By the way, the new VO Polyvalent frame was designed with this little trick in mind. If you try this, get a very stiff spring so the fender won't rattle. And be sure to use a Nylock nut; regular nuts will loosen. I wonder if we should sell a little Spring Thing kit? Before VO I started and owned a company where one of my jobs was designing small boats. The photo is of an open water sliding seat rowing boat I designed. Like all boat builders and designers I developed a keen eye for curves. The various curves that make up a hull, the sheer, the stem, the buttocks lines, the diagonals, and a lot more, define both the performance and the appearance of a boat. I spent days tweaking lines in hull design software, on paper drawings, and in the shop to ensuring that each one was as fair and pretty as could be. Sadly there are few curves on bikes and my skills are now little practiced. So I devote considerable thought to the one curve there is, the bend in the fork. 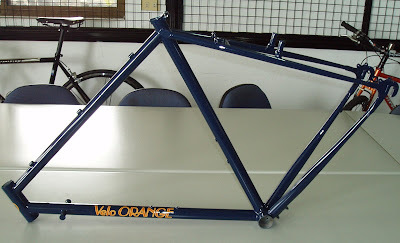 I'm rather proud of the nice bends on VO semi-custom frames, though the frame builders are ultimately responsible for them. A really pretty fork bend is one of the bigger problems when having frames made in Taiwan. Heck, many custom builders in the USA and Japan don't get it right. It's pretty tough to explain the importance of this subtle detail to a fork factory that makes thousands of forks a month that their customers are perfectly happy with. That's right, forks are usually made in a separate specialty factory, not by the frame builder. 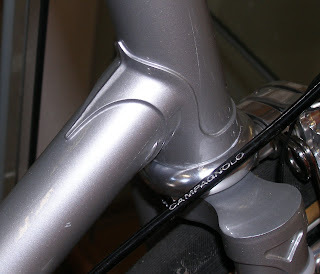 One look at the fork delivered with our sample Rando frame illustrates the problem. This is not a bend: it's a bloody dogleg. We are going to continue working with the frame and fork factory, but I'm, frankly, not sure if they can do much better than the above. I hope to make it back to Taiwan this summer and visit a small fork manufacturer I met with last month who seem interested in this issue. I'll come bearing sample French forks and a check for the required tooling. If all goes well we'll have perfect forks, but not until next year. On an unrelated topic, we have the rare and elusive canti rack mounting bolts again. The City bike is built up. I think it looks great and rides superbly. We may change the name to something like "multi-purpose" or MP frame because it works pretty nicely as an all around bike. I could see this frame being set up with front and rear derailleurs, even drop bars, and used as an all around, go anywhere machine. The production MP frame will be painted dark gray instead of deep blue; I'll reveal why in my upcoming post about the Rando frame. We are making a couple of minor changes to get the fender lines just right. And we are trying to get the fork bent in a smoother curve. But overall the prototype frame looks pretty good. The frame is a low trail (39mm), French inspired design, much like our Gentleman semi-custom frame. 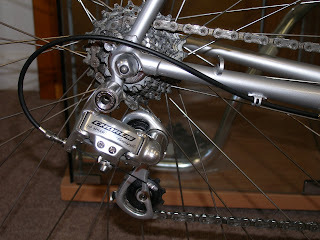 Those rear dropouts look funny in photos, as several of you pointed out. In real life they are not so bad. We used them because they are the only readily available short horizontal dropouts with the geometry suited to this frame. Instead of shifter bosses on the down tube, we'll have two cable housing stops under it. 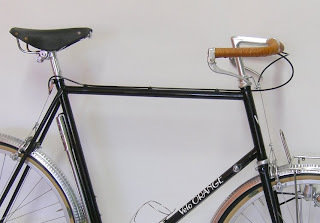 I don't think many folks will want to use down tube shifters on this frame and the stops look much cleaner, especially if the frame is set up with internal gearing or as a single speed. The first production run will be three or four sizes, probably 51, 54, 57, 60. More sizes may be added later. The rear brake cable housing is uninterrupted. I think this is the best arrangement on a city bike, I mean MP. You can sit on the top tube at the cafe without fear of bare cable marring the paint, or your work pants. The cable is not run under the top tube so as not to dig into your shoulder when carrying the bike up the steps to your apartment. The bike currently has the fenders removed to make taking measurements easier and we are working on the spring mechanism for the rear fender. I'll add photos with fenders installed later. Also, the build was just using stuff we had lying around; it's for testing only and we'll refine it later. Lots of proforma invoices have been crossing my desk recently. That's great news because a proforma invoice is usually soon followed by a real invoice. And the real invoices are sent when goods are shipped. So this means that lot's of stuff is due to be shipped to us in the next few weeks. And we could sure use more stuff! If you've been shopping at our site you may know that we are out of too many items. As I've mentioned before, we've had a great winter. Except for a couple of weeks after Christmas, there was no slowdown of the sort many bike shops expect in winter. In fact VO's business has almost doubled since last year. Thank you! But the bad part of this is that because we must place orders with factories 3 to 6 months ahead of time and because we hadn't anticipated the increase in sales, we are really low on inventory. That's not a good position to be in during the even busier Spring season. In other news, we are starting to get quotes and samples of products we requested in Taiwan. At last count we were looking at over 80 new products. I just approved production of one of the new chain guards. The rackaleur is now in prototype stage. Stainless steel decaleurs, porteur racks and rear constructeur racks are about to go into production in a new factory (the samples look terrific). Then there are the frames; I'll have a post about them soon. As always, it's busy at VO. A few new items have found their way to our warehouse. In fact we received 52 cases of parts from Taiwan this morning and our staff is still sorting through it, but here are the highlights. 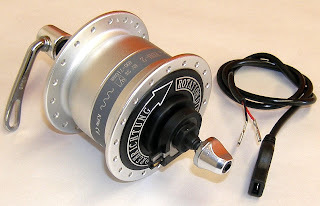 We now have the Novatec dynamo hub I mentioned last July. 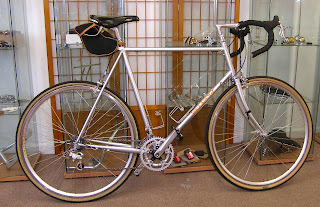 Tom has been commuting with one since then and it has proven to be 100% reliable. These have a little more resistance than the Shimano or Son dyno hubs, but then they only cost $50. At this price they'll make a reasonably priced wheel for city bikes and commuters. Randonneurs and cyclo tourists on a budget will also find them attractive. Like most dynamos, they generate 3w at 6V and so work with almost any dynamo headlight and taillight. They include a VO quick release skewer and wire with plug. 36-hole only. So we decided to make reasonably light, well made, and inexpensive internal cam quick release skewer.... The acorn nut, the one without the lever, is alloy, but it has a chrome steel face pressed on for better grip and durability. It also has a nylon insert to prevent loosening. The other end also features an alloy housing, however the lever and cam are chromed steel so they won't break when you over-tighten them. 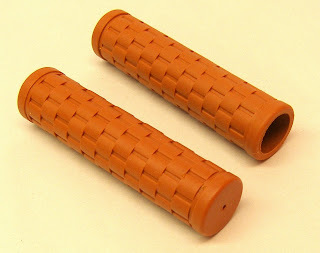 We also have some new soft Kraton rubber grips. They have a basket weave pattern that we think looks nice on classic-style bars. The color was specially mixed for us to match Brooks honey saddles. They fit 22.2mm bars easily and 23.8mm (road sized) bars with a little effort. We've decided to start stocking two models of Challenge tires. As you may know, Challenge is among the last companies producing hand made tires. Dugast, Veloflex, and one model of Gommitalia are the only others I'm aware of. Andre Dugast makes some nice wide touring tubulars that cost a fortune. 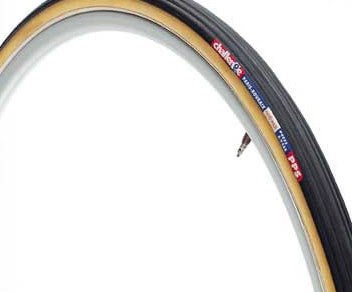 Veloflex makes a selection of expensive racing tires and Gommitalia makes a well regarded racing tubular. 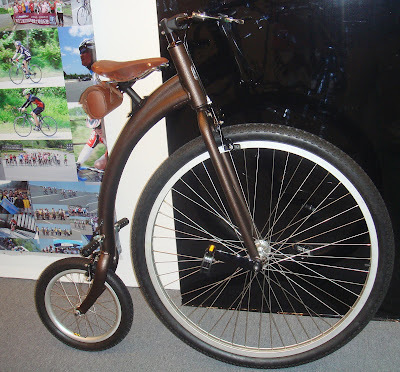 So for the randonneur or cyclo-tourist who wants clinchers, the two models of Challenge are about it. The Parigi-Roubaix model is a clintcher, nominally 27mm wide, though it sits 1-2mm wider on many rims. It weighs around 280g, has a 260tpi casing, and is said to have very low rolling resistance. All Challenge tires are completely hand-made. I'll be putting the Parigi Roubaix tires on the VO production Rando frame tomorrow and hope to offer a full ride report in a few weeks. Here are photos of the final prototypes of the VO production Rando and City frames. These frames, and the forks, should arrive here next week and I'll have more pics then. I think the Rando frame looks nice, but for three small things. The head tube probably will not be extended. 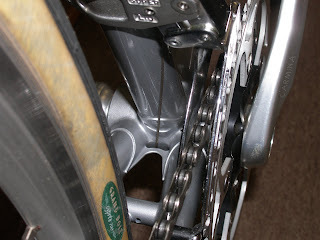 The chain stays should should go higher up on the seat lug. That means using a longer cap (or plug), which is very easy to change. And I'm not 100% happy with the appearance of the rear dropout, though it will work perfectly well. I might search for one with more of a retro look. These small changes won't neccesitate a new prototype, so if the bike builds up and rides as excpected they should be available in about 90 days. 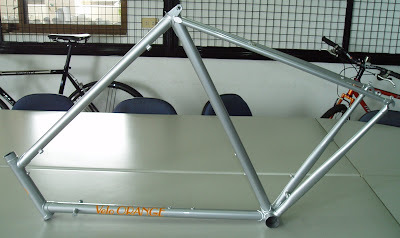 This frame has exactly the same geometry and tubing thicknesses as our semi-custom frame. I don't have final pricing yet, my best guess is around $800 for the Rando and $450 for the City (including the fork). If all goes well with testing we'll with break with tradition and accept pre-orders, or at least deposits, for the first production run. 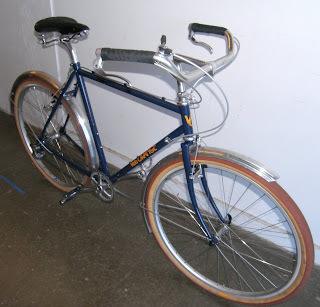 A lot of you have been e-mailing asking for a large sized mixte frame. The problem is that such frames lack stiffness. I tried to think outside the box and find away to make such a frame and still keep it reasonably light. After contacting many frame builders we think we found a solution. 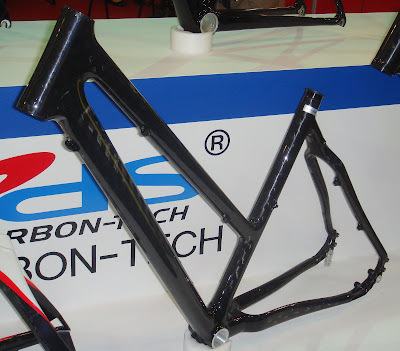 We'll have the new VO carbon step-through frames next month in sizes up to 68cm.